I admit I was a little skeptical when Merge invited me to try its new AR toy, the Holo Cube. The idea of holding a hologram in my hand seemed neat, but it also sounded like something I'd seen plenty of times before. The Cube is, well, a cube. Beyond the extravagant patterns that cover its six faces, the toy is really quite unassuming. But put on the Merge headset and you're no longer holding a plastic cube, but a transforming virtual object. At first, this took the form of a block of shifting colours, but by pressing one of the buttons on the headset it mutated again. Suddenly it was a campfire exhaling smoke. Then it was a box imprisoning a chomping Pac-Man. Then a TV I could tune by using the headset's other button. One of my favourite moments was when the block transformed into a bustling city wrapped around the cube, like a folded city from Inception. After holding it up close to watch the cars driving around the Pixar-like town, I couldn't help but feel a pang of guilt as I unleashed a meteor strike like a malevolent God. However it was the last hologram that impressed me most of all, one that can best be described as Minecraft: Palm Edition. Not officially a licensed game, I assume, it presented me with a tiny landscape with roaming animals on which I could build structures using blocks. With all the fun I was having, my skepticism had vanished. It might not be a revolutionary new form for augmented reality but Merge's cube could be an essential toy for kids who don't just want to see AR, but play with it. What's more, these were just some examples of what's possible. Really, if you can write the code for it, you can make it happen. 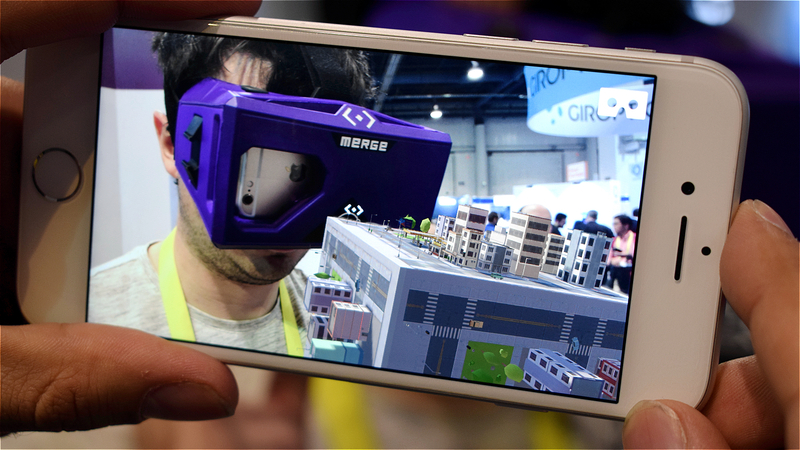 Merge's VR/AR headset is already available to buy and works with iPhones and Android smartphones, but the cube won't be launched until later in 2017. It'll only cost $20 too. By that time Merge should have more apps for it, and I'm interested to see the possible education uses this could have. Photosynthesis might not seem so boring when you can watch it happening in the palm of your hand.